Tens of thousands of people joined a spirited mass march and rally in Los Angeles on May 1 to commemorate May Day, a day that belongs to all workers. Estimates of the crowd ranged from around 20,000 to as many as 40,000 participants. The event was covered by major national and international news outlets in English, Spanish, Korean, Chinese, Tagalog and Arabic. May Day protests happened in cities and towns across the country. The Los Angeles march stretched over four large city blocks and filled Broadway, the massive street in the heart of downtown. ANSWER Coalition's contingent did not reach the main stage on 1st Street until 45 minutes into the main rally. The main themes of the march were: "Legalization now! Stop deportations and attacks on workers! Jobs, peace and justice for all!" 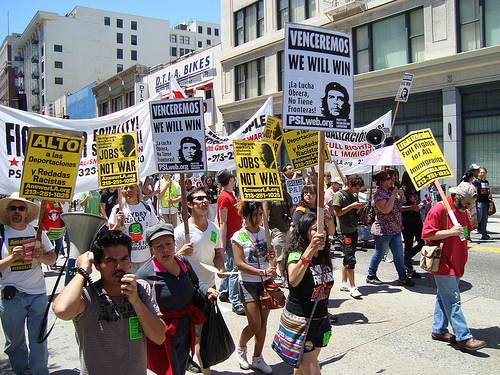 May Day 2011 was unique because of the unity constructed between many different sectors of the workers' movement. 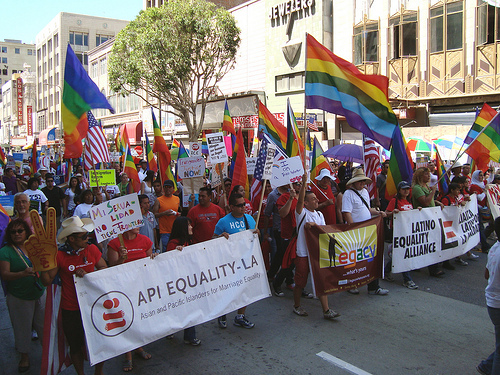 The Los Angeles County Federation of Labor, the Full Rights for Immigrants Coalition, Coalition for Humane Immigrant Rights-Los Angeles, ANSWER Coalition, Multi-ethnic Immigrant Workers Organizing Network , SEIU, LIUNA, National Day Laborer Organizing Network, COFEM and others all worked together for weeks to build the demonstration and make it a success. It was an equal partnership among all sponsoring organizations. ANSWER organizers Marcial Guerra, Peta Lindsay and Ian Thompson spoke at the May Day march. March Forward! member Ryan Endicott and Students Fight Back organizer Yvonne Bonilla also spoke to the crowd. All made the connections between the war on immigrants and workers' at home with the wars on working people abroad. Thompson said, "We demand peace and justice for everyone. ... The government spends $700 million each day to wage war on workers abroad, at the same time they say there is no money for education; that we must accept layoffs and cuts; and they blame immigrants for taking jobs." Other speakers included community leaders like Juan Jose Gutierrez of Vamos Unidos USA and the Full Rights for Immigrants Coalition, Angelica Salas of CHIRLA, Humberto Gomez of LIUNA, Jollene Levid of AF3IRM, Aquilina Soriano of Filipino Workers' Center, Immanuel Presbyterian Church elder Ricardo Moreno, Suyapa Portillo of the Queer Contingent, Raul Murillo and Angelina Corona of Hermandad Mexicana Nacional, Arturo Garcia of Alliance-Philippines, Pablo Alvarado of NDLON, Shakeel Sayed of the Islamic Shura Council of Southern Californa, Arturo Carmona of COFEM and many others. The people who made this march possible included multinational groups of immigrant workers--from Mexico to El Salvador to Sri Lanka--LGBT rights organizations, unions and people of all different backgrounds. The protesters did not plead, but demanded an end to the attacks on workers, including the racist deportations of immigrants that have increased massively under the Obama administration. It is clear to many that the people have no place in the agendas of the Democratic or Republican parties. Obama has only paid lip service to immigration reform, and now the masses of immigrant workers are realizing that something needs to be done. Sandy Mejia from Apple Valley summed up the march, "May Day has been a success. Our voices were heard trough every corner of Broadway street thanks to the working-class families that dedicated this day to speak up about their struggle." For more info and to get involved in the struggle: 213-251-1025, answerla@answerla.org or www.AnswerLA.org. Report by Carolina Morales. Photos by Raymond White and Jessica Bardales.